Circulating tumor DNA (ctDNA) is a component of cell-free DNA that is shed by malignant tumors into the bloodstream and other bodily fluids. Levels of ctDNA are typically low, particularly in patients with localized disease, requiring highly sophisticated methods for detection and quantification. 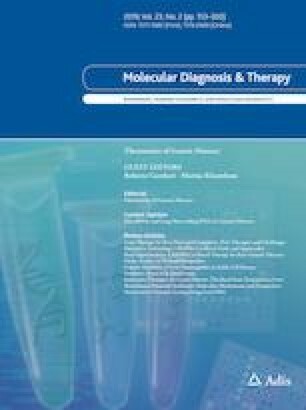 Multiple liquid biopsy methods have been developed for ctDNA analysis in solid tumor malignancies and are now enabling detection and assessment of earlier stages of disease, post-treatment molecular residual disease (MRD), resistance to targeted systemic therapy, and tumor mutational burden. Understanding ctDNA biology, mechanisms of release, and clearance and size characteristics, in conjunction with the application of molecular barcoding and targeted error correction, have increased the sensitivity and specificity of ctDNA detection techniques. Combinatorial approaches including integration of ctDNA data with circulating protein biomarkers may further improve assay sensitivity and broaden the scope of ctDNA applications. Circulating viral DNA may be utilized to monitor disease in some virally induced malignancies. In spite of increasingly accurate methods of ctDNA detection, results need to be interpreted with caution given that somatic mosaicisms such as clonal hematopoiesis of indeterminate potential (CHIP) may give rise to genetic variants in the bloodstream unrelated to solid tumors, and the limited concordance observed between different commercial platforms. Overall, highly precise ctDNA detection and quantification methods have the potential to transform clinical practice via non-invasive monitoring of solid tumor malignancies, residual disease detection at earlier timepoints than standard clinical and/or imaging surveillance, and treatment personalization based on real-time assessment of the tumor genomic landscape. Re-I Chin and Kevin Chen contributed equally as co-first authors of this review. This work was funded by the NCI under award number K08CA238711 (A. A. Chaudhuri), a Cancer Research Foundation Young Investigator Award (A. A. Chaudhuri), the Washington University SPORE in Pancreatic Cancer Career Enhancement Program (A. A. Chaudhuri), and the Conquer Cancer Foundation ASCO Young Investigator Award (A. A. Chaudhuri), supported by Takeda Pharmaceuticals. Any opinions, findings and conclusions expressed in this material are those of the authors and do not necessarily reflect those of the American Society of Clinical Oncology®, Conquer Cancer®, or Takeda®. Aadel A. Chaudhuri has received speaker honoraria and travel support from Varian Medical Systems, Roche Sequencing Solutions, and Foundation Medicine, Inc., has research support from Roche Sequencing Solutions, has served as a consultant for Tempus Labs and for Oscar Health, and is a scientific advisor for Roche Sequencing Solutions and for Geneoscopy, LLC. Jonathan C. Dudley has served as a consultant for Merck. Re-I Chin, Kevin Chen, Abul Usmani, Chanelle Chua, Peter K. Harris, Michael S. Binkley, and Tej D. Azad declare that they have no conflicts of interest that might be relevant to the contents of this review. FoundationOne® Liquid. Foundation Medicing Inc.; 2018. https://www.foundationmedicine.com/genomic-testing/foundation-one-liquid. Sun Yat-sen University. ctDNA for prediction of relapse in gastric cancer [ClinicalTrials.gov identifier NCT02887612]. National Institutes of Health, ClinicalTrials.gov. https://clinicaltrials.gov. Accessed 11 Feb 2019. Johns Hopkins University and the Walter and Eliza Hall Institute of Medical Research. Circulating tumour DNA as a marker of residual disease and response to adjuvant chemotherapy in stage I–IV ovarian cancer [ClinicalTrials.gov identifier NCT03691012]. National Institutes of Health, ClinicalTrials.gov. https://clinicaltrials.gov. Accessed 11 Feb 2019. University of California, San Francisco. Biomarkers for risk stratification in lung cancer [ClinicalTrials.gov identifier NCT03774758]. National Institutes of Health, ClinicalTrials.gov. https://clinicaltrials.gov. Accessed 11 Feb 2019. Institute of Cancer Research, United Kingdom. A trial using ctDNA blood tests to detect cancer cells after standard treatment to trigger additional treatment in early stage triple negative breast cancer patients (c-TRAK-TN) [ClinicalTrials.gov identifier NCT03145961]. National Institutes of Health, ClinicalTrials.gov. https://clinicaltrials.gov. Accessed 11 Feb 2019.